Copyright 1973. 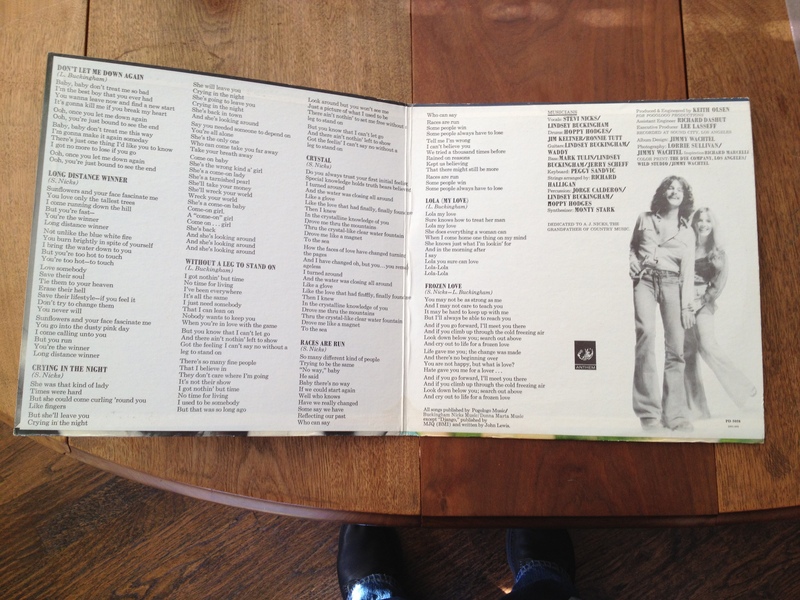 Album was re-issued in 1975, but this is a first pressing. 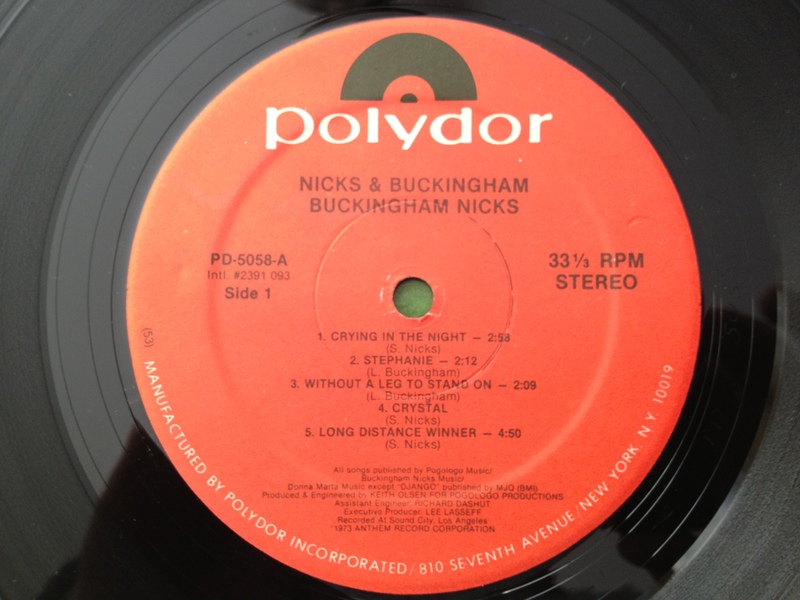 Stevie Nicks and Lindsey Buckingham made this record after breaking up their current band Fritz. It was a tough decision for them because they had become so close to their fellow band members. Tension had built up in the band because Stevie Nicks was getting more and more of the attention at their live shows. By the way, Fritz must have been a pretty good band. They opened shows for Janis Joplin, Jimi Hendrix, Credence Clearwater Revival, and even Santana. 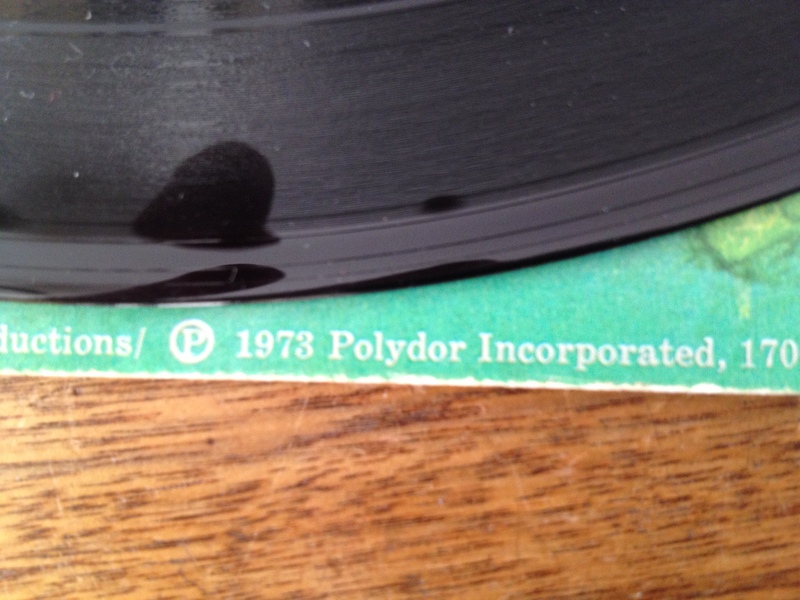 But Polydor records was calling and they had to grab the brass ring while they could. They had no idea how the course of their lives had just changed. They thought they’d make this record, do a tour (possibly using some of the members of Fritz) and then pick up where they had left off. And that is what very likely should have happened. Stevie and Lindsey were romantically involved at this time. They were also dirt poor. The two of them were waiting tables and getting any side gig they could during the recording of this record. Money got so tight that at one point the producer, Keith Olsen, had to let them move in with him. Then something amazing happened. Fleetwood Mac was in the midst of another major personnel change. Bob Welch and another band member had left the band leaving Mic and John and Christine McVie. Mic Fleetwood flew to California in search of a studio to record their next album and one or two new band members. He walked into Sound City Studio where Stevie and Lindsey were recording their new album. The first song he heard was Frozen Love. This song features the great guitar work of Lindsey Buckingham. The song is over seven minutes long and a tour de force rock song. Mic immediately asked Lindsey to join the band. Fleetwood was very disappointed to learn that it was a package deal. Lindsey said it was both of them or none of them. The negotiations went on for some time but in the end Lindsey won out and the rest is history. This song was written by Stevie Nicks. Tell me this doesn’t sound like Fleetwood Mac. This song could have been on any of the records they made with Lindsey and Stevie. This is just a great song! How did this not become a hit? The one thing we know is that Polydor really screwed up on the promotion of this great record. One of two great instrumentals featuring Lindsey Buckingham’s awesome finger picking style of guitar playing. It goes without saying that Lindsey also wrote the song. Once again this song (written by Lindsey Buckingham) sounds like it belongs on a Fleetwood Mac album. If you heard this song on the radio you would say “Hey that’s a new song from Fleetwood Mac!” It kind of has an “Empire State” feel to it from the “Mirage” album. This song was written by Stevie Nicks. This song actually did end up on the first Fleetwood Mac album they made. Great harmonies in the chorus. It’s just a beautiful song. This song could be the root inspiration for the opening song on Rumors: Second Hand News. I think the similarities are stunning! This song is so good that it could have been substituted for Second Hand News and Rumors would have been just as great an album as it is today. This is the other instrumental on the album. It is written by John Lewis. John Lewis was the pianist for The Modern Jazz Quartet. The music is a tribute to the great Brazilian Jazz guitarist Django Reinhardt. Many guitarist will tell you that Django was the greatest guitarist who ever lived. He had two paralyzed fingers and played all of his guitar solo’s with two fingers. You can imagine why Lindsey might want to put a tune on the album like this. This is beautiful guitar playing by Lindsey Buckingham. This song was written by Stevie Nicks and it is absolutely beautiful. I love the way Lindsey slides down the neck of the guitar to get the song going. The harmonies in the chorus are awesome. This could have easily been on any Fleetwood Mac album. The acoustic guitar solo in the middle of the song is sublime. The song fades out leaving you wishing that this song was longer. This song was written by Lindsey Buckingham. When the song starts it almost can fool you into thinking that “The Chain” is being played. It has that banjo sound to the guitar. This is the weakest song on the album, but it’s still a good song. It certainly can’t be lumped into the category of “filler”. This song was written by Stevie Nicks and Lindsey Buckingham. If you liked the Buckingham Nicks Line up of Fleetwood Mac, then you can thank this song for all the hits that followed. This is the song that Mic Fleetwood heard that caused the merger of the two bands. This song is a powerful coda to the album. It makes you wonder what would have happened if they had stayed on their own instead of joining Fleetwood Mac. You can hear the root of everything that Fleetwood Mac went on to become in this last 7 minutes of great rock music. The song starts out quietly and builds and builds… I really enjoy the duel lead guitar sound in this song. Stevie’s voice is powerful and emotional.